If you have a loft in your house or, you live in a loft apartment then, there is a high-key chance that you are looking for loft storage option for making the most out of the space. There is a way to convert the unused space into a desirable room. One if the ways is getting a fitted slopping ceiling wardrobe or you can convert the space into a fitted home office. Having a properly designed made-to-measure built in closet might make the room look inviting and cosy. Probably all of us had at least once to sort the endless amount of bank statements, utility bills, pay slips etc. And have you ever had to look for that marker, pen or envelopes that you thought you’ve put in the most obvious place? In this case, having a bespoke home office with fitted bookshelves, stationery drawers, shelving for folders, storing boxes in a proper and organised way. Lofts often have unusual floorplan and it might very difficult to find the furniture that would not only look appealing but also would fit in to the room. Therefore, it is required for you to work with a manufacturer who would give you a professional idea on how you can maximise the storage space in the room and even make it look larger and lighter? 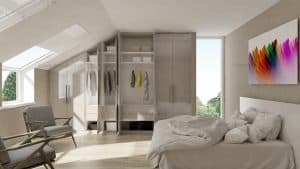 How about having a made-to-measure modern wardrobe or traditional custom closet fitted on the wall with slopping ceiling and having a set of matching bedside tables and a fitted bookshelf or may be bespoke make up table made in the same style? Another way to make the most from the slopping ceiling room is to create a custom made walk-in wardrobe. It can be done without any doors if the space is limited. Do you prefer your fitted wardrobe to be spray painted or you are after the modern look? Your fantasy and the space are the only limits with i-Wardrobes. All our furniture is made-to-measure to make sure you not only get the storage solution you have designer yourself, but also get the most out of the storage solution created.